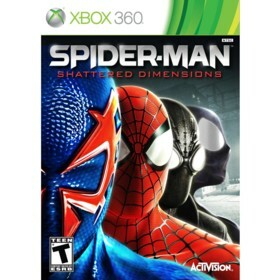 Spider-Man: Shattered Dimensions is a Xbox 360 game in the Action genre. The game was published by Activision and developed by Beenox. The game has an ESRB Rating of T (Teen 13+) and was released on 2010-09-07. The game's official site can be found at spidermandimensions.marvel.com/#/home. The best Spider-Man game in years, maybe ever. Spider-Man: Shattered Dimensions is the latest Spider-Man game released for current generation consoles. The game gets is subtitle from the fact that you get to play as Spider-Man in four alternate universes/dimensions: the classic and most well known Amazing Spider-Man universe (where he wears the standard blue/red outfit), the Ultimate Spider-Man universe (where he wears the black symbiote outfit), the Noir Spider-Man universe (a black and white universe that takes place during the great depression), and finally the 2099 Spider-Man universe (where he wears a futuristic blue/red outfit). I am a big fan of Marvel but haven't read any of the comics in quite a while so the Noir and 2099 Spider-Man Universes were quite new to me. The game begins in a museum where Mysterio is trying to steal the a magical Tablet known as the Tablet of Order and Chaos. Spider-Man shows up and during the scuffle to recover the artifact Spider-Man accidentally shatters it into many pieces. Madame Web contacts Spider-Man and informs him that the Tablet pieces must be recovered in order to restore balance to the various Marvel Universes. The game itself consists of 3 Acts (with each Act being introduced via an amazing cutscene with voice over by the creator of Spider-Man himself, Stan Lee). Each Act contains four levels (one per universe). Each level focuses on one of the Marvel Villians (from the respective era) having found one of the fragments and its Spider-Man's job to track them down and defeat them. The range of villians is amazingly varied - from Kraven to a futuristic version of Hobgoblin. I obviously won't list them here as half the fun is discovering who is in the game yourself (the two I mentioned are the initial bosses for the amazing and 2099 universes so don't worry nothing has been ruined :)). If you are trying to unlock everything the game will last you a good while. I spent about 1 hour per level on my first playthrough completing each of the challenges, locating the 8 hidden spiders, and performing tasks to complete several other achievements. A second playthrough is required on the highest difficulty as well if you want the full 1000 achievement points. All the upgrades and moves you purchase on your first run-through carry over to subsequent playthroughs as well. I spent a total of about 20 hours to max out the game. The game itself has great production values. The only thing I can fault is that occasionally the camera angles get a bit wonky when crawling along walls and sometimes the colors are a bit too dark (Noir) or too bright (2099), but other than that it was fairly good for a third person action game. Also, the fact that each of the universes has such a different look and feel (for example, the Noir Universe is completely black and white and with gameplay similar to Splinter Cell while the 2099 Universe has really bright colours with the gameplay revolving around speed and fighting) helped keep the monotonous feeling that plagues these games to a minimum. Overall, this is a great action game even if you don't know anything about Spider-Man that is even better if you do :).